We’re having a Team Challenge! Members of our team create a new item based around a theme – currently “Bountiful Farm.” Here are the items that are inspired by and crafted for this challenge! We hope you enjoy and please be sure to let us know how you think the participants did! We’d love to hear your comments! Mother’s Day in the US is coming up in just a couple of days. 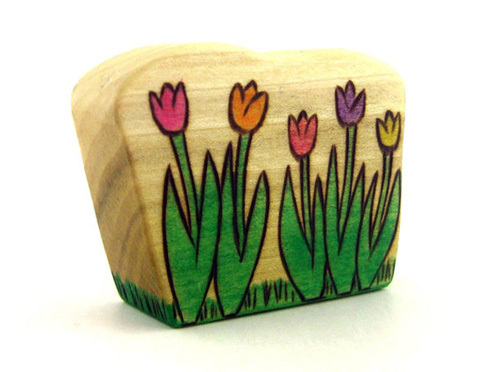 Now, here at Natural Kids we are, of course, known for our natural, handmade children’s products. But this week I’d like to do a little giveaway just for the mamas. My own mother is a constant source of encouragement and support to me. I truly could not ask for a more perfect mom. She challenges me, she backs me no matter what, and she respects the woman I have become, even if she doesn’t always agree with me. I can only hope that my own children will feel the same way about me. 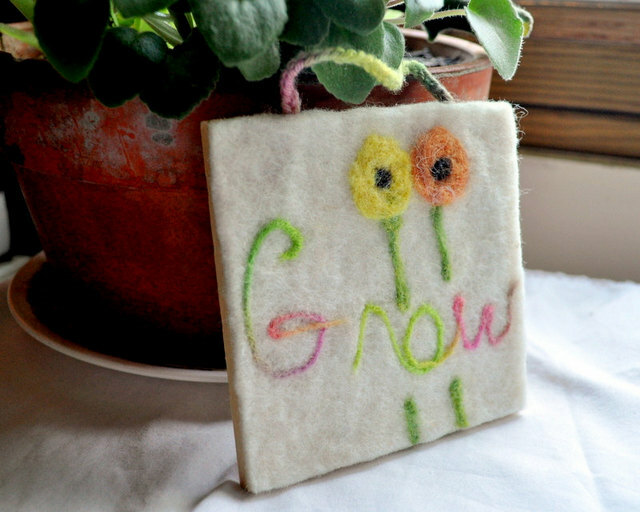 Today I want to offer to one mama the above two items; a knitted rose brooch in the winner’s choice color and the wool plaque, backed with wood, with the word ‘Grow’ needle felted on it. I am also offering a coupon code good for 15% off your entire purchase in my shop through May 19th. Enter NKMAY at checkout. Leave a comment on this post. Don’t forget to leave us a way of contacting you. Giveaway is open worldwide. Natural Kids team members are not allowed to enter. 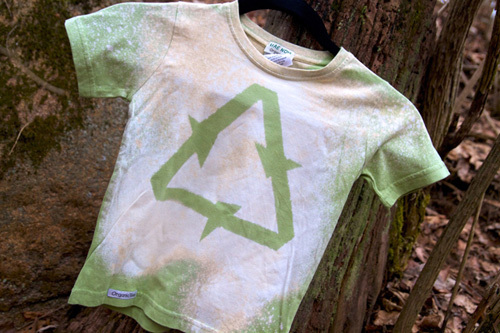 Nine Awesome Earth Day Giveaways! The NaturalKids Team is devoted to protecting the earth and it’s natural resources; it is a critical part of what our team represents. We strive to encourage sustainability and the use of natural, renewable, recyclable, compostable and biodegradable materials throughout the year. 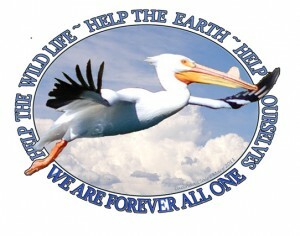 Earth Day, however, provides us a perfect opportunity to go “all out” and really celebrate the choices we make. Please join us in our celebration by participating in, and sharing, the amazing giveaways from member shops you will find below. “My best tip for celebrating is get your kids involved! They love to see things grow and I think it’s a great day to get out in the garden, plant or transfer those seedlings and dig!” Check out this article on planting with children for more! I carry chico bags made from recycled plastic in my purse. I love the kind that fold into their own pouch. AND I love the look on the cashier’s face when I pull out my stash of bags to bag my own groceries. Earth Day is a great day to get outside and explore nature with your children. A little walk/hike is always fun. Geocaching is also a great way to explore and appreciate the outdoors. *10. 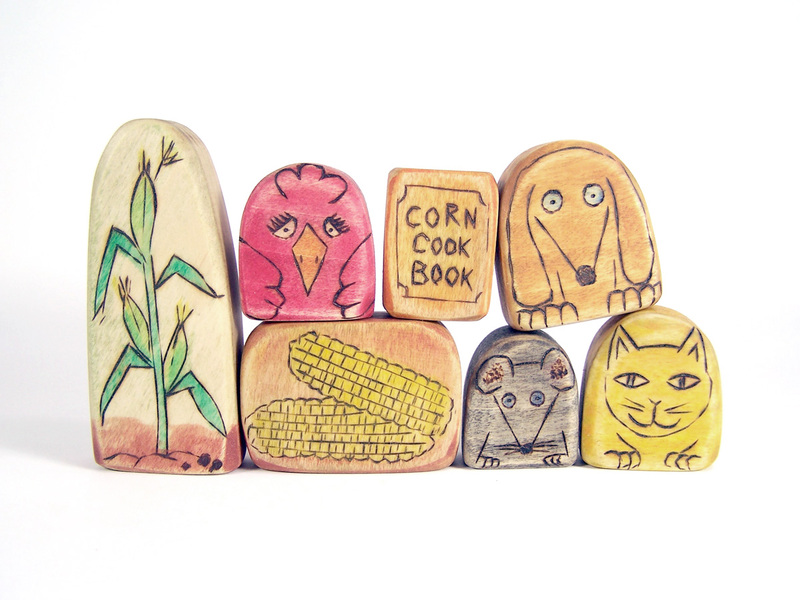 In case you missed it, The Enchanted Cupboard is also giving away a wooden playset! Make sure you leave a comment if you haven’t already! Contact Us to claim prizes if they have not been contacted. Giveaway is open worldwide (exceptions noted above). Natural Kids team members are not allowed to enter. In addition to the giveaways above, several shops are running Earth Day sales or other promotions! 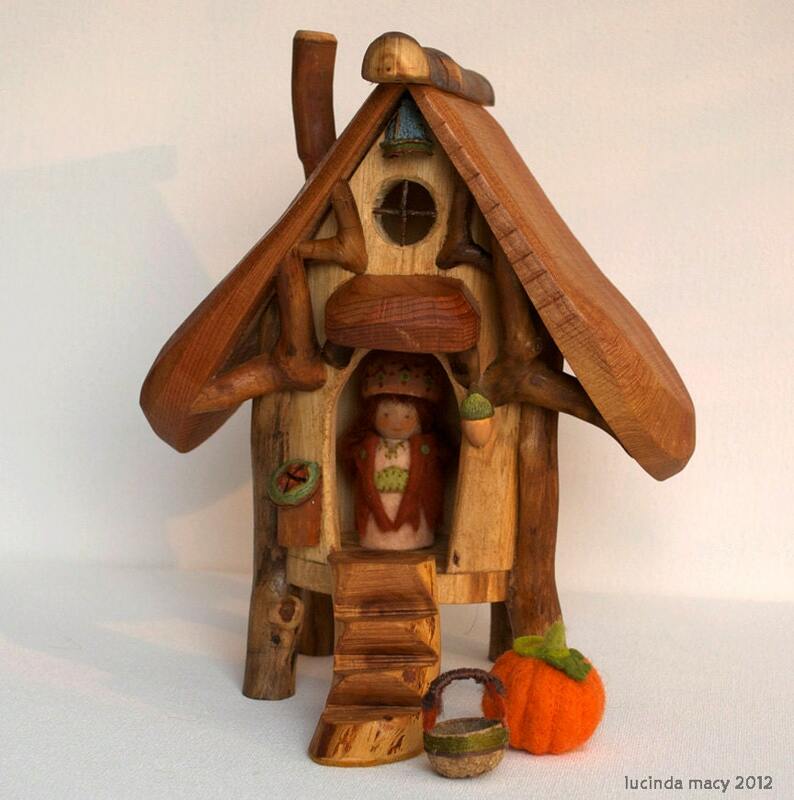 The Enchanted Cupboard — MudHollow — Mama West Wind – Earth Day sales, no coupons needed! 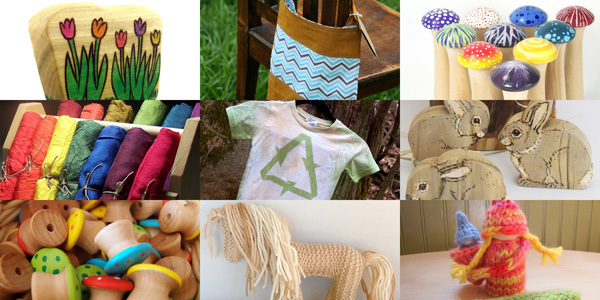 Nobby Organics – all baby items (dolls and doll clothes are excluded) are 20% off for Earth Day. The sale will run until April 29th. Also giving away a raw amber teething necklace. Congratulations! I’ve already contacted you via email and you have through 4/21 to respond. 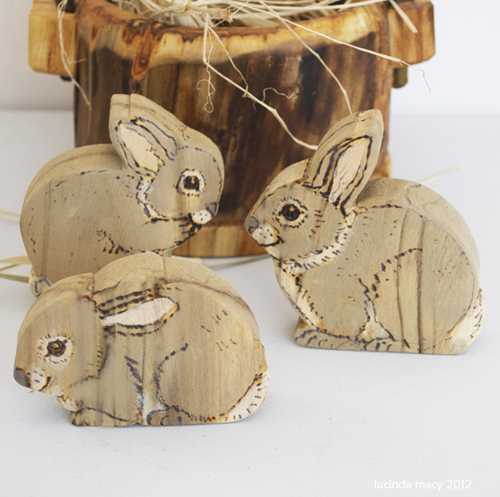 This week our giveaway is sponsored by Andrea of Ziezo Designs. Andrea is a fairly new member of the Natural Kids team, so let’s take some time to get to know her a little better. I am a SAHM of 3 (Boys 4, 5 & Girl 7) and married to my best friend. Our family has been living in Nairobi, Kenya since the middle of 2007. 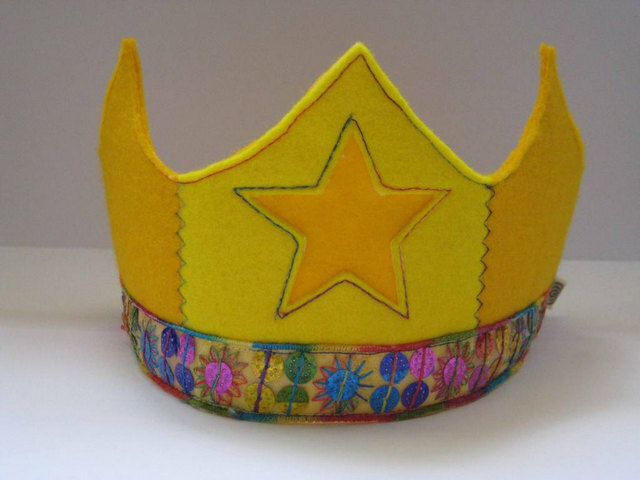 Being a SAHM allows me to re-connect with my design background, particularly sewing, and as the children attend Waldorf School/Kindergarten, I get more and more time to create things. 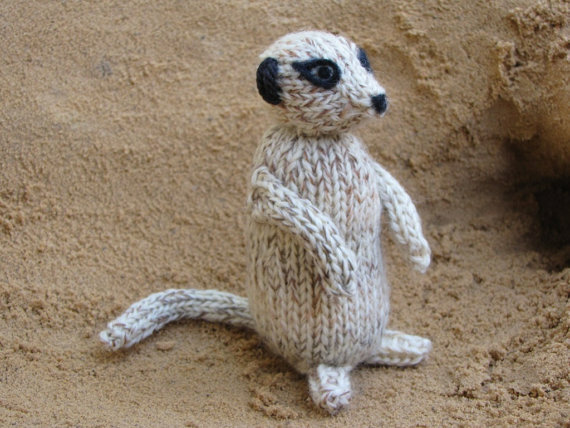 I love working with natural materials such as 100% wool felt, wool, silk and cotton as those work well with crafting in the Waldorf tradition. Living in an environment where toys in shops are mainly electronic or otherwise battery-driven, I started crafting and creating toys for my little ones early on. 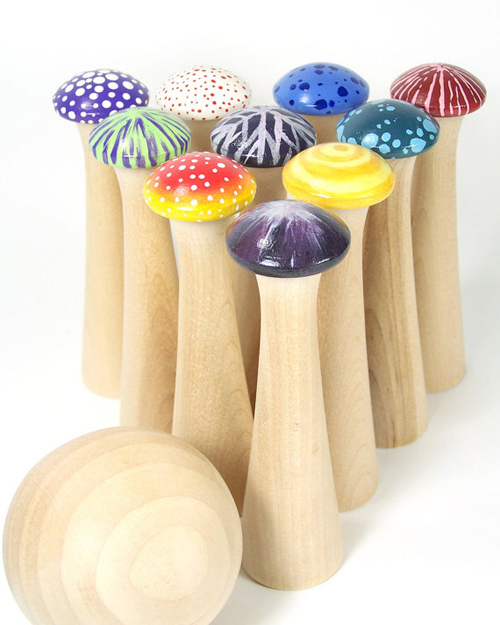 An entrepreneurial friend of mine encouraged to take my passion a step further and start creating larger quantities of natural toys, so others could enjoy them as well. Every item in my shop is truly and thoroughly “child” tested and approved with the exception of non-toys such as the ornaments and buntings/banners. My main inspiration comes from my children and their respectful, wondrous, and innocent view of the world and nature. Creating something that enhances their imagination and creativity is such fun. 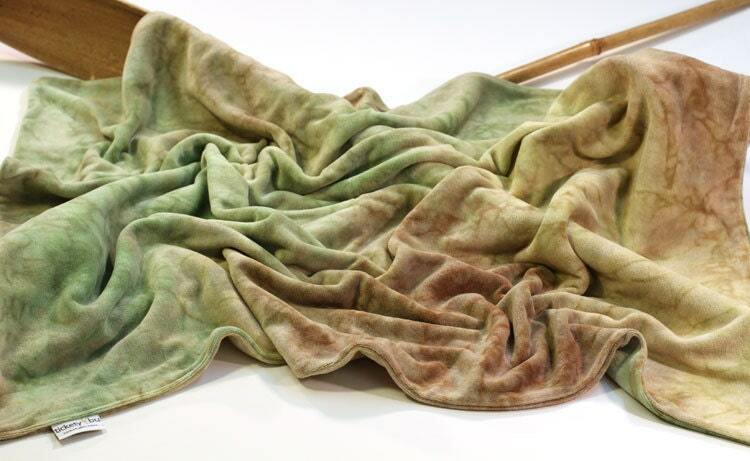 Natural materials such as silk, wool and cotton are my favourites. They are so nice to work with, the feel and characteristics of the natural materials are a totally different experience from man-made materials. I feel often that this is what Nature intended for us: use the gifts that she gave to work with, rather than trying to invent another material. How do you encourage children’s creativity? I believe that children are naturally creative and curious. I try to do some of my creative work while they are around and where possible to have them join in, in the painting, knitting or sewing. It’s always interesting to see what they come up with and I do share the outcomes of those processes on my blog. In addition, they certainly have the benefit of attending a Waldorf school, where their creativity is stimulated as well. 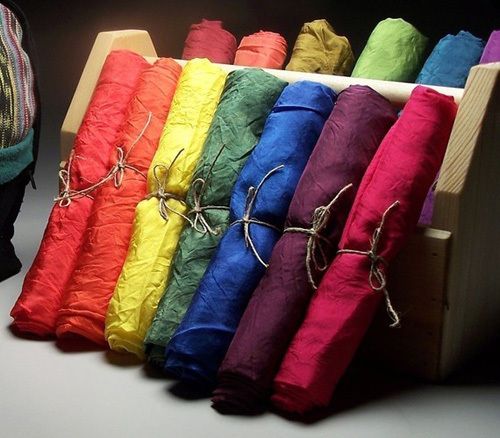 Today Andrea is offering to one winner 100% silk butterfly wings in rainbow colours. 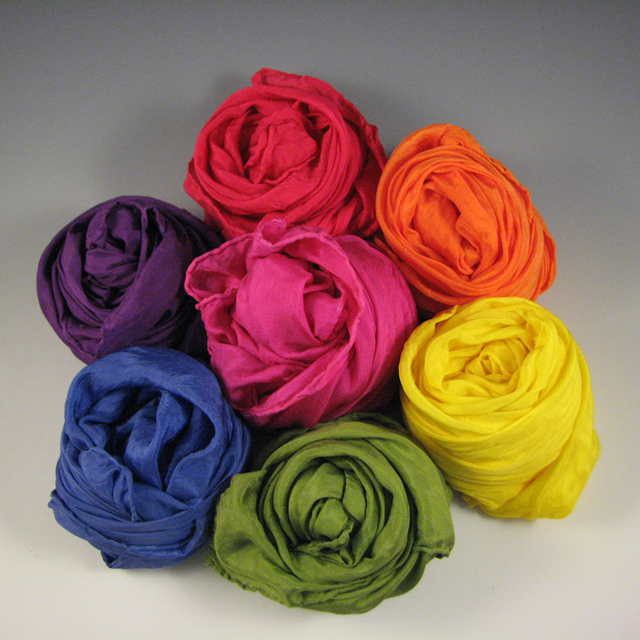 The habotai silk is hand-dyed in non-toxic professional grade dye. The wings are embellished with a yellow satin ribbon on the back, creating the illusion of the butterfly’s body. 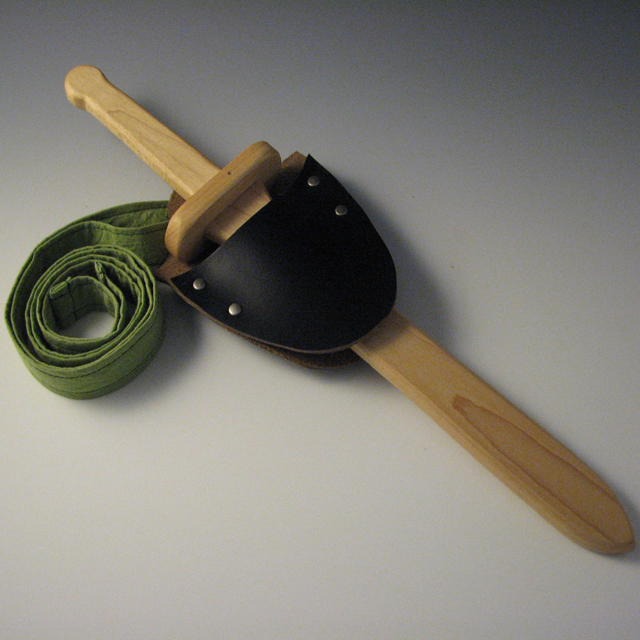 Elastic shoulder- and wristbands make it comfortable and easy for children to dress and undress themselves. 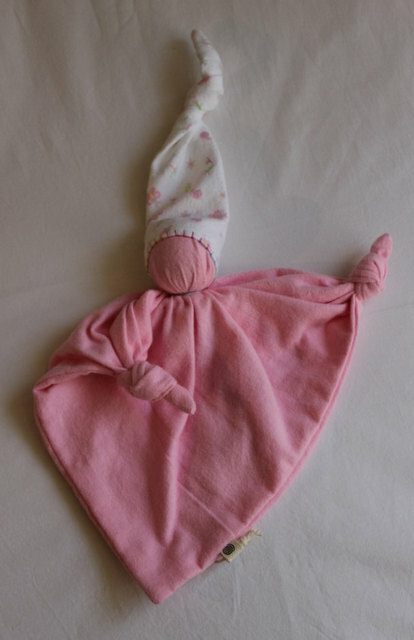 This ‘small’ size fits most children 2-5 with an arm length of up to 35cm. 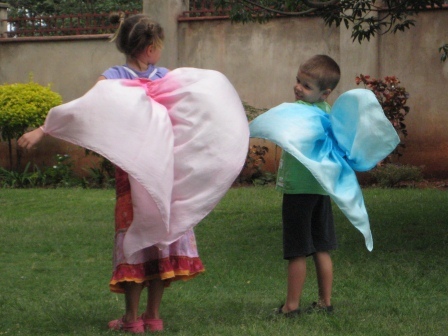 The pure silk cloth moves gracefully with the airflow when your child “flies” through the air. Giveaway is open worldwide. Natural Kids team member sare not allowed to enter. The winner is Journeys of The Zoo! I’ve already contacted you and you have through 4/24 to get back to me with your mailing address. 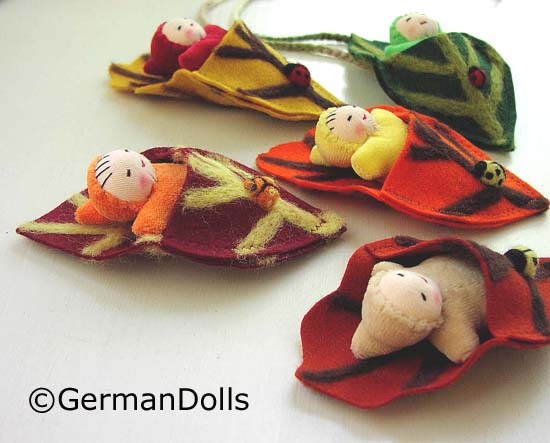 Today’s giveaway is sponsored by Ulla Seckler aka GermanDolls. 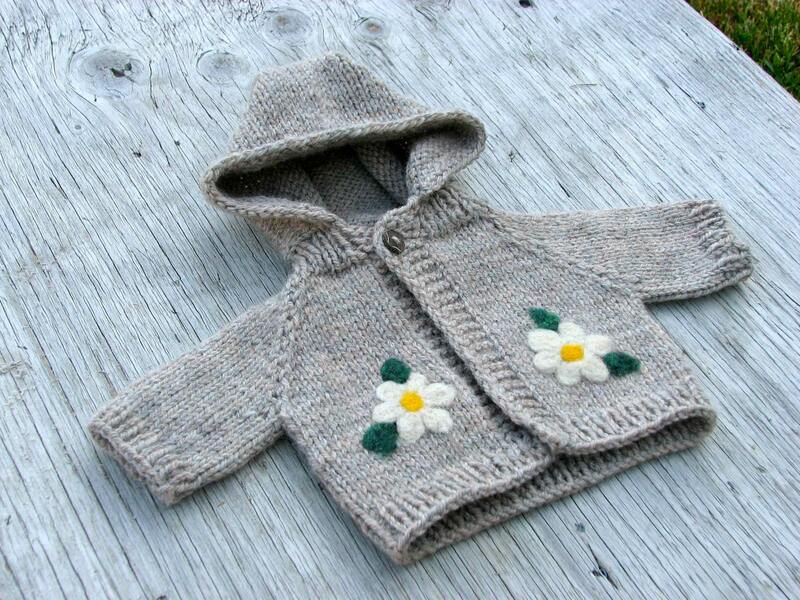 Ulla is a longtime member of the NaturalKids Team on Etsy. Enjoy the interview with our veteran seller on Etsy. 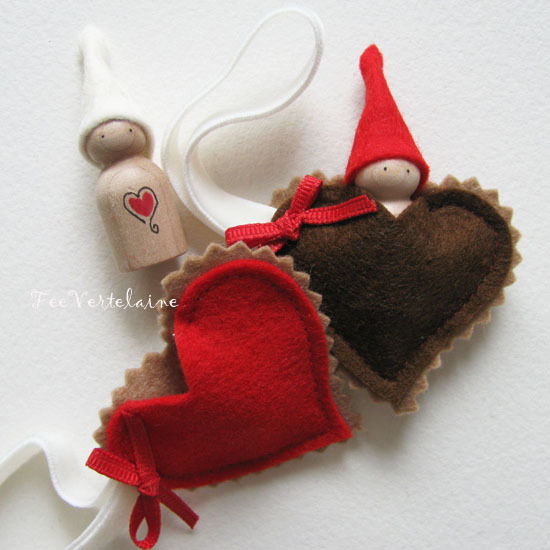 Ulla will be giving away ONE of her cute Necklace Leafbuddies which have been a bestseller in her shop. Please read the rules at the end and comment if you would like to win this cute little one. Just keep reading back on the blog if you would like to get to know me better. My name is Ulla Seckler, a transplant from Germany, dollmaker, blogwriter, mom to two children, married to a teacher, living in beautiful Colorado. I can see the mountains where we live but we don’t live in them – unfortunately. 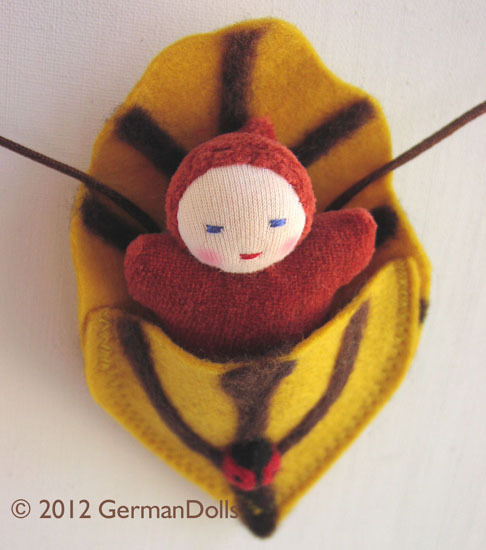 My work is definitely inspired by my German heritage and love of sewing and crafting. I grew up in household with 4 sisters. We all loved to draw and make stuff. We also got to play outside and roam by the river. I think nature has always played an important part in my life. 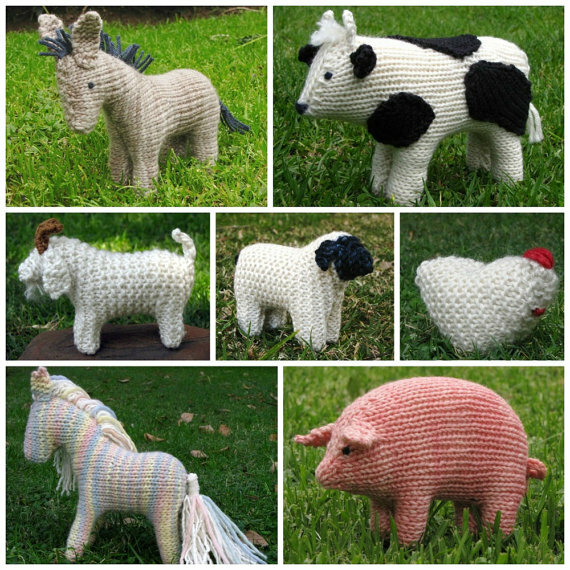 I love wool in any form or shape. I use it in its raw form for stuffing my soft dolls. I use mohair and other yarns for making doll hair and wigs. 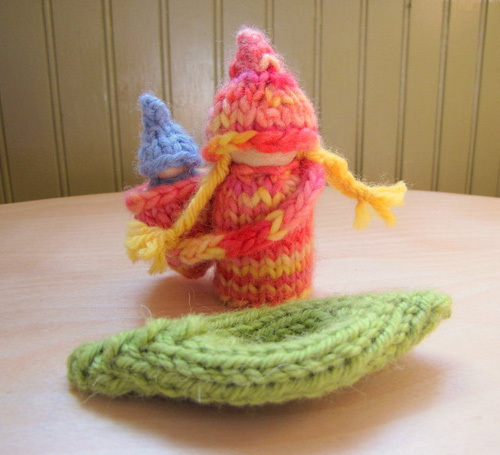 I utilize wool roving for needlefelting and woolfelt for doll shoes and my cute little Leafbuddies. The second most important material I use is fabric for my dollclothes. I am kind of addicted to Japanese cloth. If I was rich I’d have a room filled with stacks and stacks of pretty fabric. How do you balance you family life with creating? I am an early morning riser. I get up around 4 AM because I love to use those peaceful morning hours before everyone gets up to read and write. 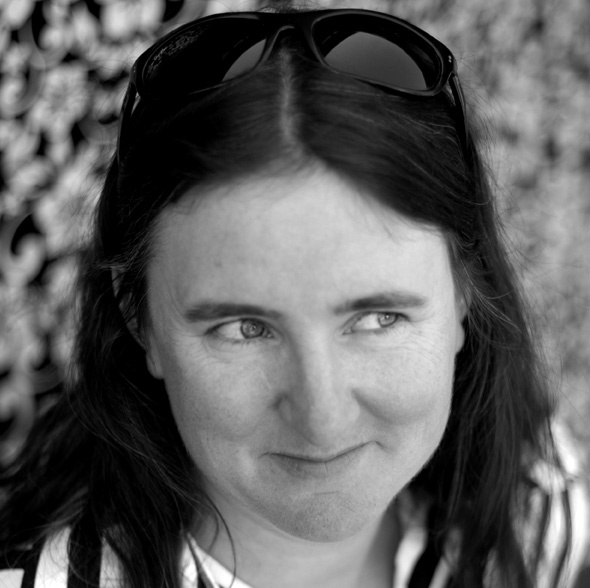 I like to write on my blog and the NaturalKids team blog. It’s amazing how much one can accomplish while the rest of the family is asleep. I have been a stay-at-home mom forever. I love it because I can be with them when they are sick. I don’t homeschool but I see so many parents who send their kids to school sick because they have a job and are afraid to stay home with their kids if they are sick. I love my job because it gives me that freedom. How do you keep the inspiration well pumping? I love what I do and get mostly inspired by my family and my customers who often send me photos and wonderful feedback and notes about my work. Sometimes when sales are slow I get down on myself. In fact, this past March was such a month. I didn’t have a single sale in over 10 days and felt really bad because of it. I think it’s important for artists and crafters to keep creating and believing in your product. Don’t let the slow times get you down. Just keep making the things that you enjoy and eventually sales will pick up again. You must believe in yourself or nobody will! 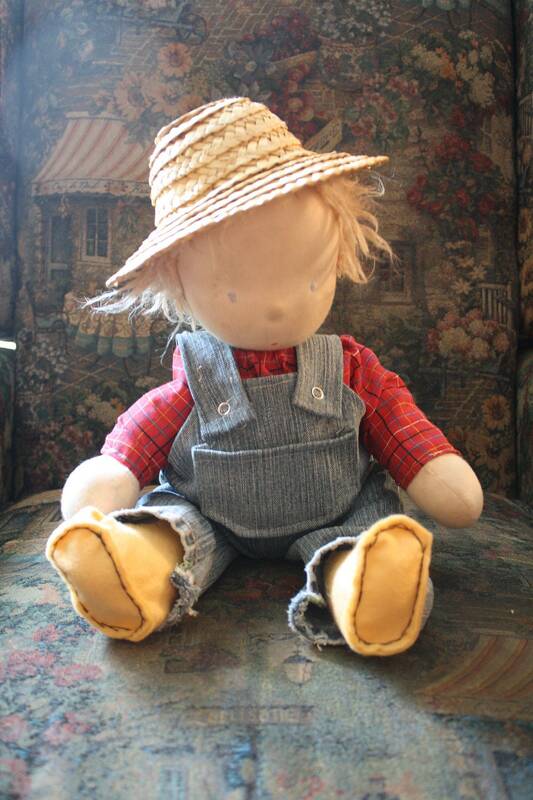 I started making dolls and dollclothes when I had children of my own. 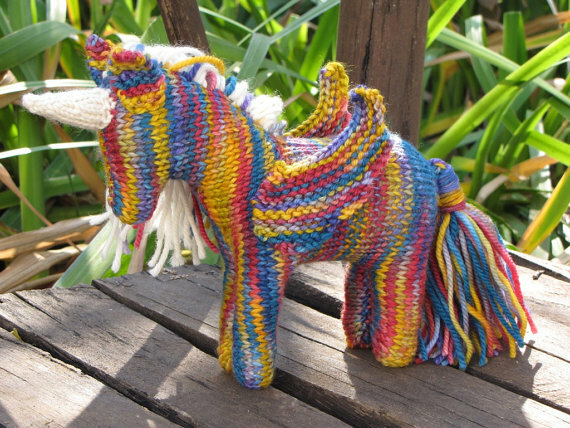 I grew up with homemade toys made by my mom, grandma, and grandpa. 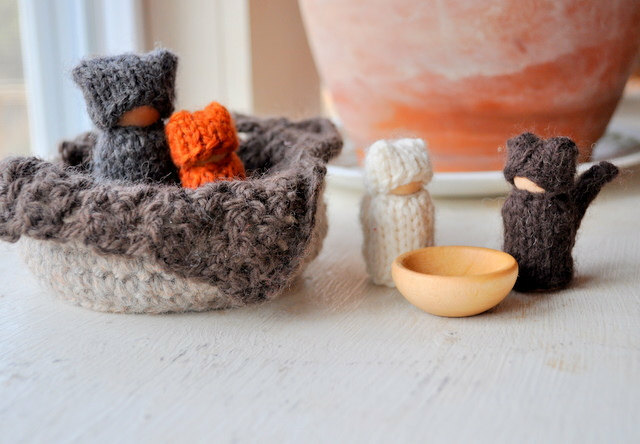 I believe in the special power of handmade toys. 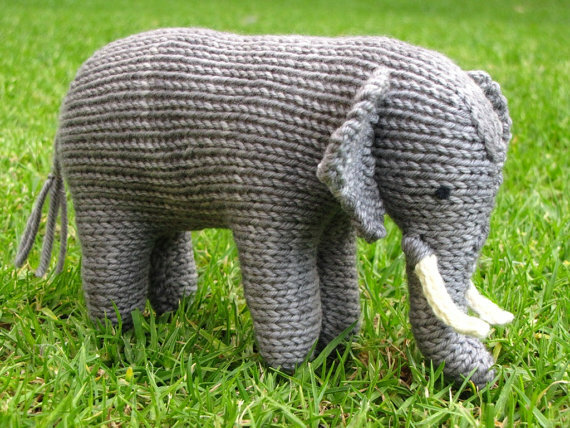 Nothing says I love you like a toy made by a real person. What advice do you have for others, trying to make a business with their craft? It’s really tough to make a decent living making toys. Especially in the doll market life has become much harder and more competitive these days. In order to stand out you have to perfect your craft every day. It takes years of promoting and creating quality products to achieve success. Photos are really important. Online shopping is all about great pictures because people cannot touch your work and you must create an image that conveys the quality of your work. 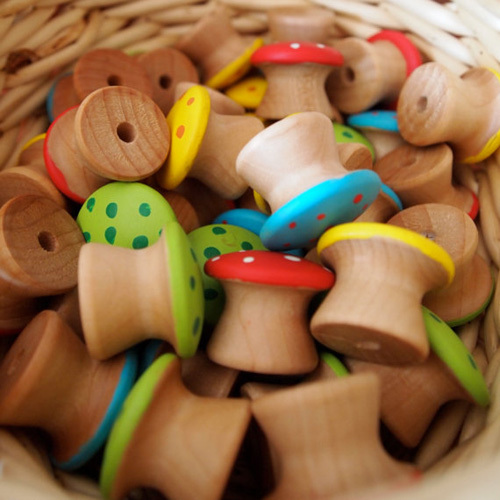 What thoughts do you have for parents on the importance of natural toys for creative play? 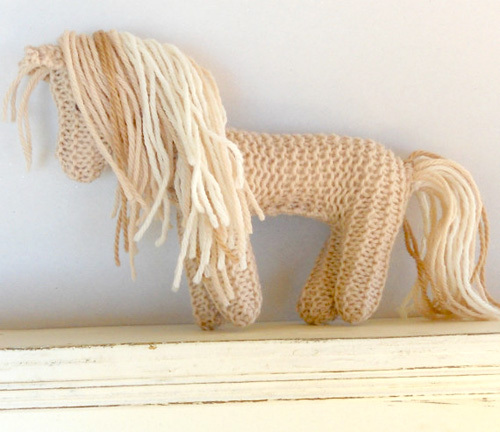 I think kids are naturally drawn to handmade toys if they receive them. They can feel the love that goes into them. It’s like magic! How can you win this Giveway? 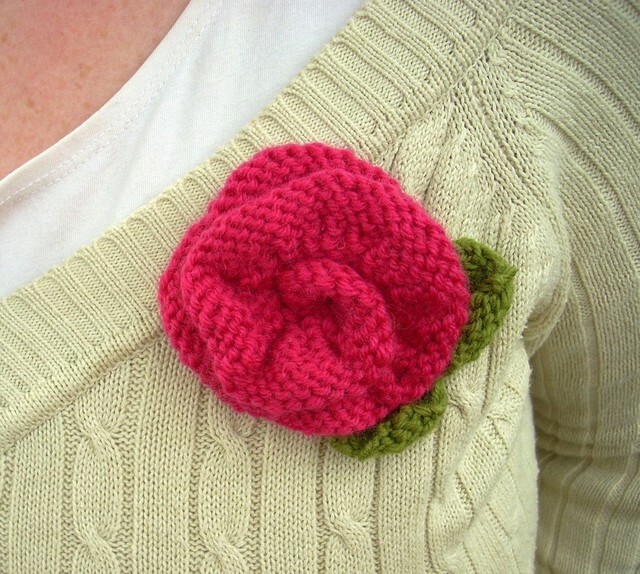 Visit Ulla’s shop and make it a favorite today. Maybe you can drop her a line and tell what is your favorite item in her shop. This Promotion is Worldwide. You have until next week Wednesday to leave a comment. Please, note that Members of NaturalKids Team and their families cannot participate in this promotion. The Winner will be announced next Thursday (4/12). Comments on this giveaway are now closed and the winner has been announced at the bottom of the post. 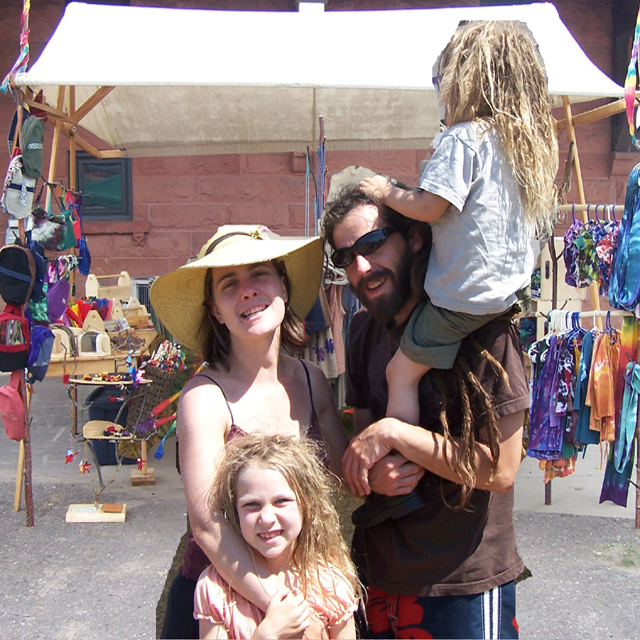 This week’s interview and giveaway is coming from Natalie who keeps shop at Woolhalla. Let’s get to Natalie a little better. 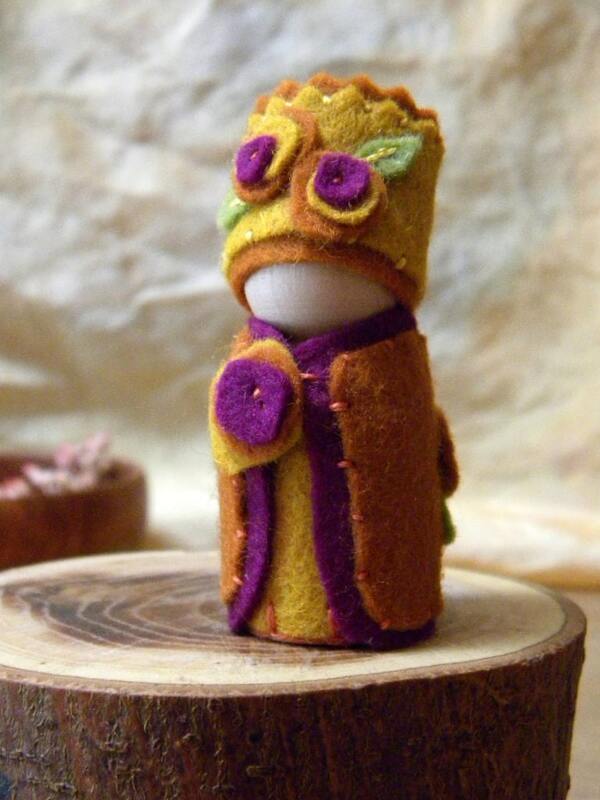 I am a WAHM who likes to design & makes wool felt toys & waldorf-style dolls. I also run a supplies company so my craft stash never runs dry! My three children (plus 2 dogs & 1 cat) keep me quite busy, but I often find a little time to enjoy the outdoors or referee roller derby games. My children and all the other children out there inspire me to create natural material play options. Silk, wool and cotton are my top 3. I think children naturally gravitate to the warmth of natural toys and when they have more open-ended toys they engage their imagination more. A great example is playsilks, they seem to be used for decorating, dressing up, carrying dolls, and even tying small bikes together! 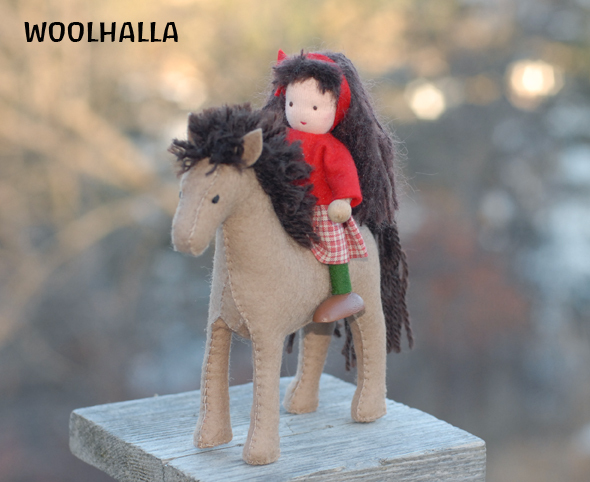 Today Natalie is offering a wool felt horse and dollhouse doll. 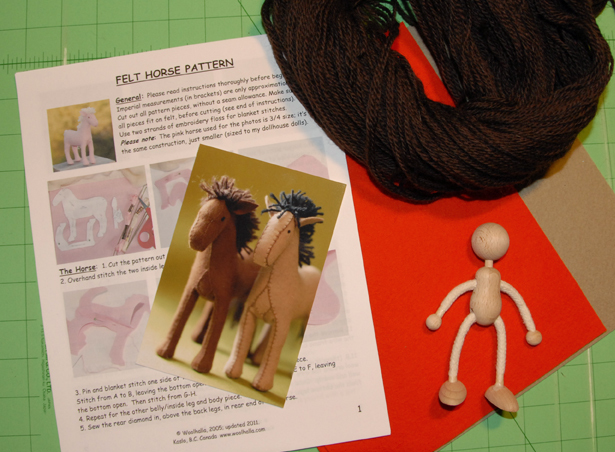 The horse is a 3/4 size version of her horse pattern so that it is in scale with the dollhouse doll, which is approx. 11 cm/4.5″ high. 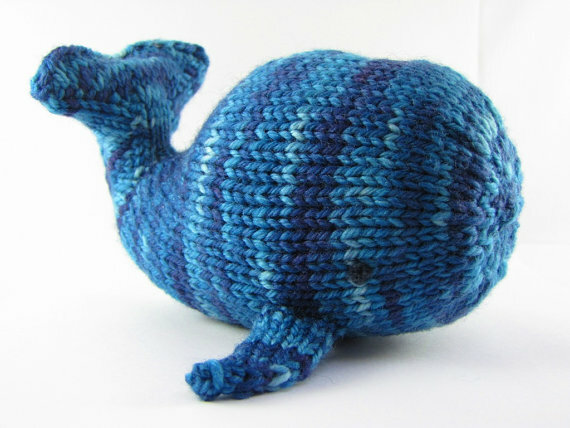 Visit Woolhallaand leave us a comment letting us know what your favorite item in her shop is. We will choose a winner randomly on December 20th, 2011. Please, make sure we have a way to contact you! The winner is comment #6, Andrea! Comments on this giveaway are now closed. The winner has been announced at the bottom of this post. 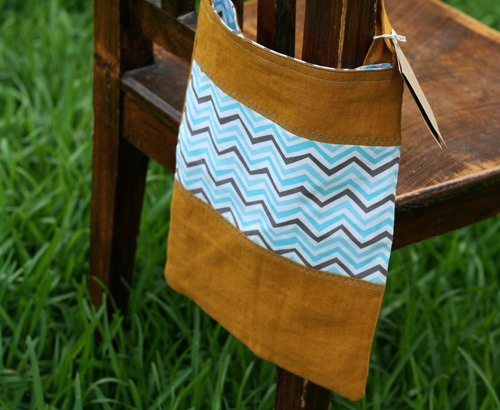 Our giveaway this week comes from Wendy and Mojo of BirchLeaf Designs. Their wonderful shop is full of beautiful play silks and hand made wooden toys. Let’s get to know them. We are BirchLeaf Designs, a home-spun, hand-crafted family business. 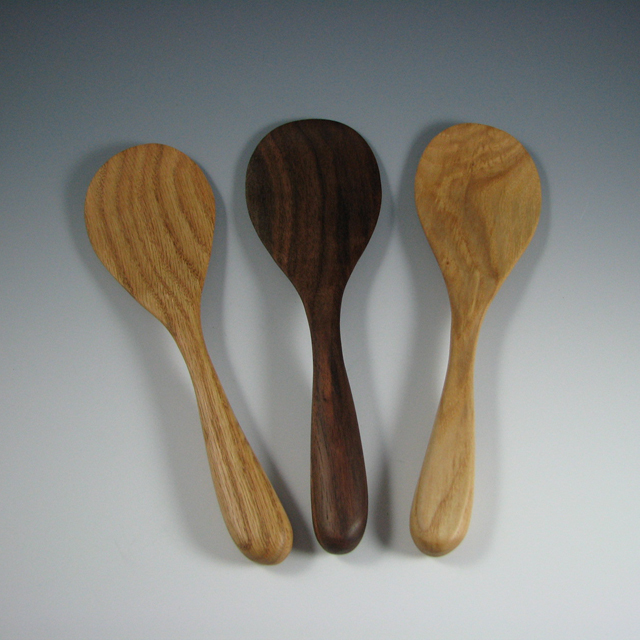 We make natural playthings for children and adults plus some housewares, as well. We live, learn, and create off the grid at our homestead tucked away in the woods. Balancing family life and creating can be a circus act! Especially when you toss in a bit of homeschooling and other work as well! We go about our day with a little of each in order to “get ‘er all done”. The most important thing is to keep it fun! The best advice we can give others is to take the leap of faith! You have to dive in, give it your best and trust that everything will be alright. Being your own boss is so liberating and our children learn so much about all aspects of the business. Give them the tools and invite them to keep their minds “wide open”… anything goes! Tools include being outdoors as much as possible! Also, having open-ended playthings, like playsilks and little baskets full of acorns or scraps of wood and the like. Our children love to craft with us too! They like to paint on cards with watercolor, make faeries and other woodland creatures. They love to make things out of wood, like wands and carved knives and also make jewelry with copper and glass beads. All they need is a little support and open-ended materials. Natural playthings are so important for creative play! They just feel good to the touch and are good for the soul! 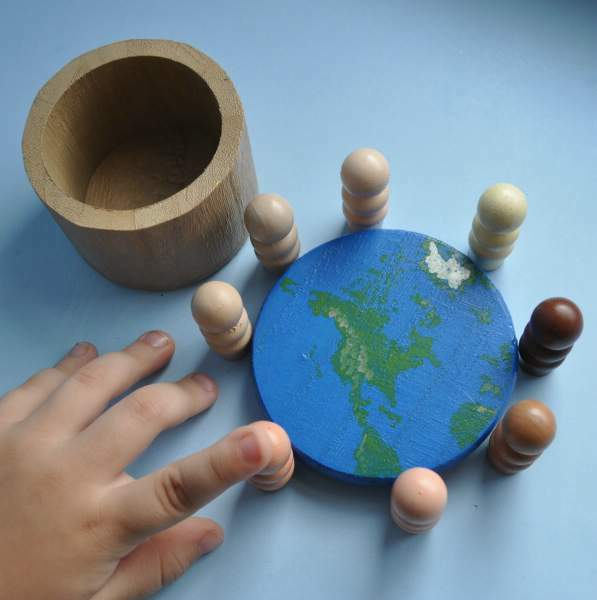 You can rest knowing that your children are playing with things that are not only good for them, but also good for the environment. 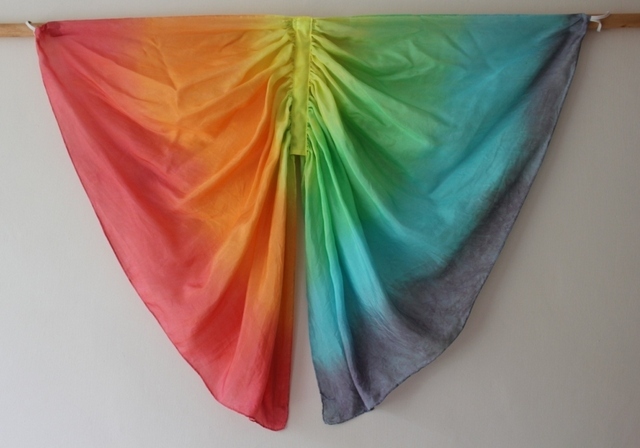 Wendy and Mojo are offering two 35×35″ playsilks from any set…you get to choose the colors! 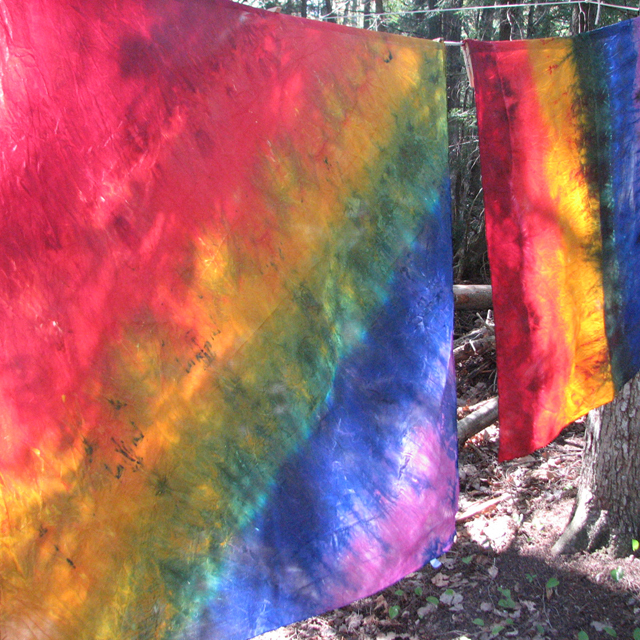 Their silks are hand-dyed with love and care. Visit BirchLeaf Designsand leave us a comment letting us know what your favorite item in her shop is. Like BirchLeaf Designs on Facebook. Congratulations, Andrea! I will contact you right away. Julie Hunter is a single mama raising 3 spirited girls, two babydoll sheep, angora rabbits and a gaggle of chickens and ducks in the North Carolina Foothills. 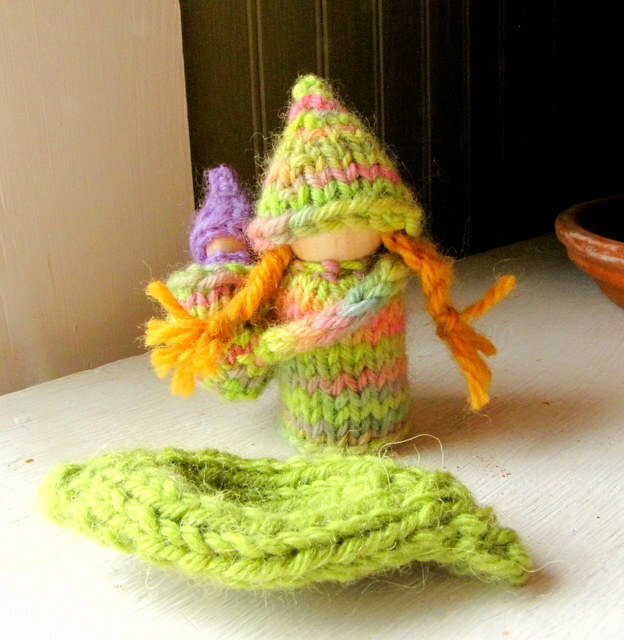 She spends her days at home, crafting with her children, homeschooling, taking long gathering walks in the woods and knitting Waldorf-inspired toys. You can find her blogging and keeping shop at This Cosy Life. Comments on this giveaway are now closed. The winner has been announced at the bottom of post. This week’s giveaway is from Kelley, from Little Elf Toy Shop. 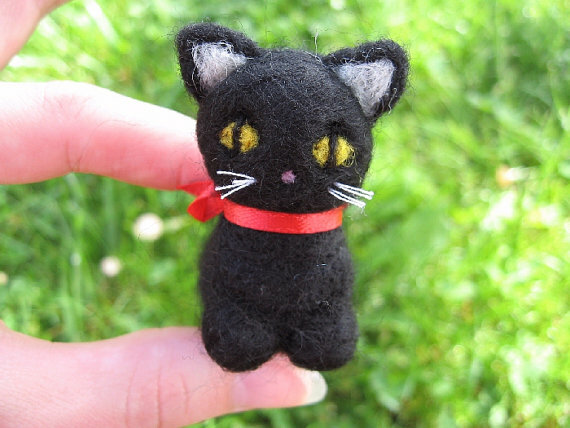 Kelley makes the tiniest, most adorable needle felted creations, which you can find in her Etsy shop. Let’s get to know Kelley a little better. 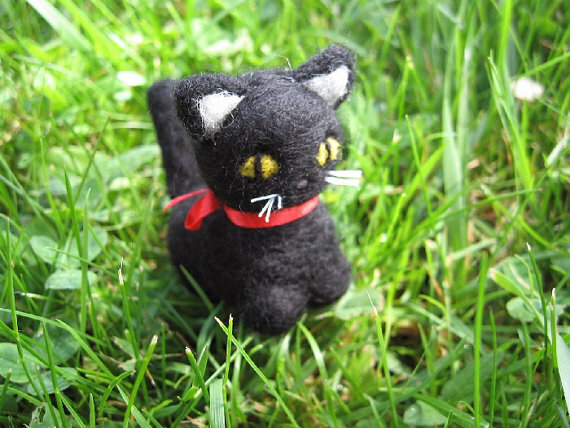 One lucky winner will have the chance to win a cute little black kitty that is made entirely out of wool and longing to bring smiles your way. Kelley calls him Shadow but you may feel free to give him a new name. 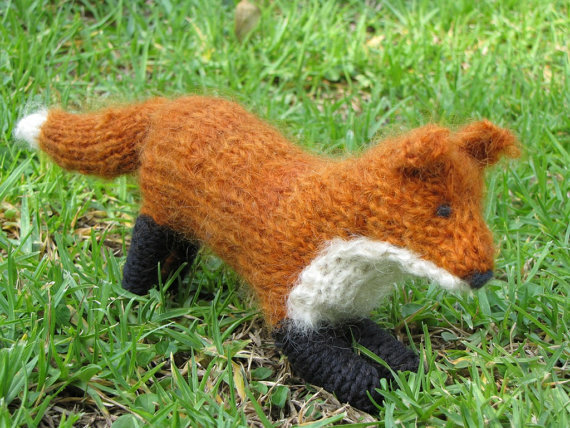 He is completely needle felted and wears a handsome red ribbon around his neck. Good luck to all the participants! 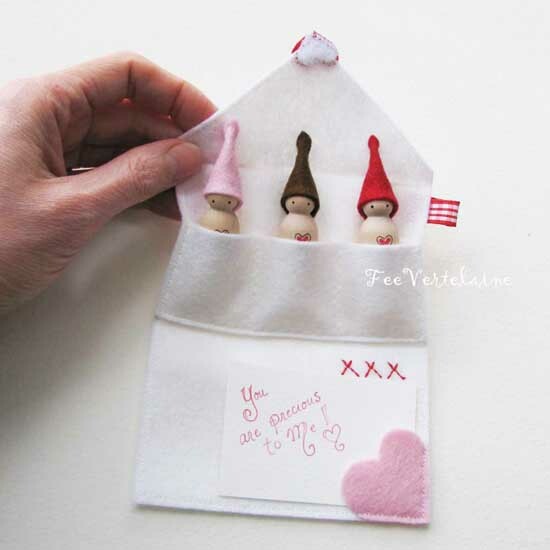 Visit Little Elf Toy Shop and leave us a comment letting us know what your favorite item in her shop is. A new winner has bee drawn since I was unable to make contact with the first winner drawn. The second runner up is Krafterskorner.